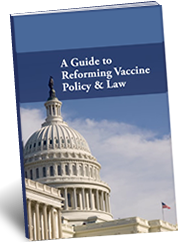 This guide explains the basis for the legislative work we do with the NVIC Advocacy Program to protect and expand vaccine exemptions. You can use this 55 page referenced guide with legislators and policy makers to help educate them about the importance of the bills we advocate for or against. Achieving and protecting the right to informed consent to vaccination is more important now than ever before, and we need your help to make that happen. NVIC wants to help you, our members, to organize and make a difference in your home state right where you live to protect and expand vaccine exemptions. It is at the state level that mass vaccination policies are made, and it is at the state level where your action to protect your rights can have the greatest impact. Also, when national vaccine issues occur, you will be plugged in to the information and action items necessary to make sure your voice is heard. Register to be an NVIC Advocacy Team Member: Just minutes of your time on letters, emails, and phone calls to your state legislators and the media can make the difference. NVIC will send you advocacy alert emails when action is needed to support efforts in your own state and nationally on important legislation and policy to protect and expand vaccination exemption laws. We will provide you with the steps, tools and connection to leaders and organizations to help you make a positive impact on your rights to exercise informed consent in the vaccination decision making process. With your registration information, we are able to calculate exactly who your elected officials are and display direct links to connect you to them on your personal view of your state team page. This also allows us to reach you by email with a dedicated alert for your state when action on a bill is critical. Registration information is kept confidential within NVIC. Make a donation to the National Vaccine Information Center! Membership and use of the NVIC Advocacy Portal are free, but we count on your donations to make this happen. NH HB 331 2/27/2019 SUPPORT House Environment and Agriculture Committee, Committee Report: Inexpedient to Legislate Allows veterinarians to make decisions regarding rabies vaccines bases on titers. FL 3/16/2019 Attend NVIC Training and Capitol Visitor Day No Tracking Thursday March 21st at Florida Capitol!